"School Spirit (or Cheerleaders from Heck)"
Kitty helps save St. Searle's and is reunited with Excalibur. Kitty and her classmates see off Miss Rutherford, who is heading to London to meet with Courtney Ross in the hopes of acquiring a loan to save the school, then the girls board a train of their own for the cheerleading competition in London. Meanwhile, Mesmero tests Excalibur's capabilities against some Ministry of Defense drones. Later, Kitty and the girls arrive at Wembley Stadium and meet the professional cheerleaders they have to beat. Elsewhere in the stadium, Mesmero seemingly meets with the individuals extorting him, who turn out to be Fenris. Just then, Mesmero reveals himself as Meggan, destroying Fenris' robotic bodyguards. As Kitty and the St. Searle's girls perform their routine, the rest of Excalibur attack Fenris. Spotting the Phoenix effect, Kitty realizes her teammates are back on Earth, and leaves in the middle of the routine to help them. She gets into trouble, however, prompting the underclassmen to rally the upperclassmen to abandon their routine to help her. Mesmero tries to bring Kitty under his thrall as well, but Lockheed attacks him, breaking his concentration enough that the rest of Excalibur come to their senses, just as the St. Searle's girls attack and overpower Fenris. After the villains are handed over to Scotland Yard, Coutney Ross helps broker a deal between Miss Rutherford and the owner of the English football team, who was impressed with the girls' cheerleading routine, in which the team will lease space for training facilities to the team, thus saving the school. A grateful Miss Rutherford still insists that Kitty will be punished for all the rules she broke while trying to save the school, but Kitty doesn't have the heart to tell her she'll be rejoining Excalibur. This is Chris Claremont's final issue of Excalibur (at least until he relaunches the series as New Excalibur in the 00s), making it his third departure from an ongoing X-book (following New Mutants and Wolverine) and final departure from an X-book he helped launch. His absence ushers in a long run of fill-in creators before Alan Davis returns as the new regular writer and artist with issue #42. 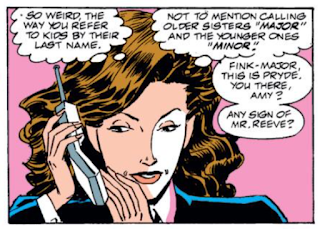 This issue also marks Kitty's return to the team, after being separated since midway through the "Cross-Time Caper". 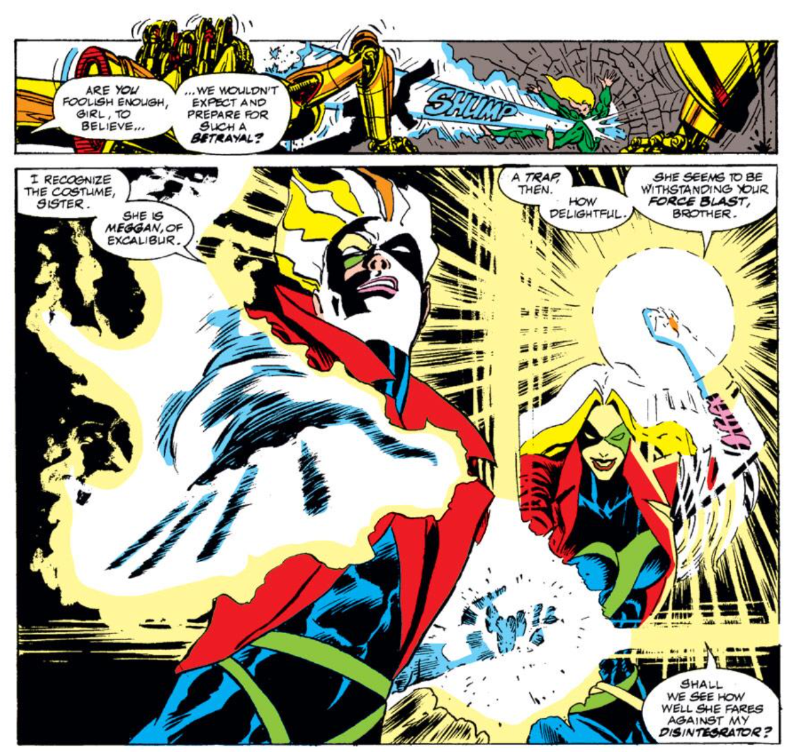 Fenris is revealed to be the force extorting Mesmero into using his legitimate position of influence for their own goals, and are defeated by Excalibur (with an assist from the girls of St. Searle's) in the course of the issue. For those of you following along at home, this is the last issue of the series available via Marvel Unlimited at this time, until the Alan Davis run begins. Kitty points out the British custom of calling classmates by their last names rather than first, and of using "major" and "minor" to differentiate between siblings, the latter of which being a custom I've never encountered before (what happens when there's more than one sibling?). Brigadier Stuart is shown to be immune to Mesmero's influence, something which doesn't get an explanation in this issue. Kitty compares traveling underground while phased to swimming through the earth. Kitty notes that as a Cubs fan, she knows long odds, to which Phoebe rightly points out, that really just means she's used to losing. 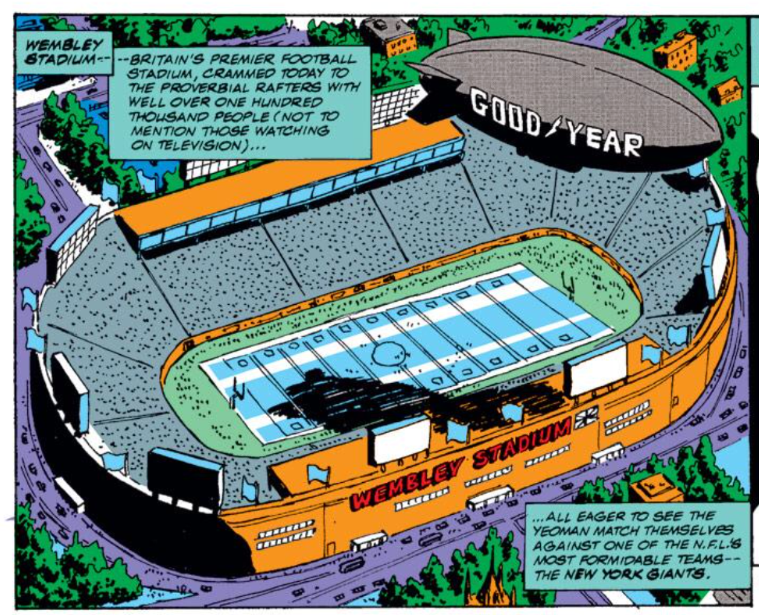 The new British football team is playing the New York Giants, who were something of a powerhouse team in the late 80s, and would, indeed, win the Super Bowl in January of 1991, a month after this issue went on sale. 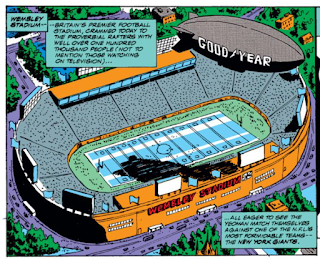 And, of course, nowadays the NFL regularly schedules one or more games each season in London, played at Wembley Stadium (as in this issue), as part of their efforts to take over the world. "Girls School From Heck" comes to a mostly satisfying conclusion, with St. Searle's being saved, Mesmero's extortionist revealed, and Kitty reunited with Excalibur. It's perhaps a bit too plot heavy - Claremont probably could have started with the girls already at the cheerleading competition - and, of course, Kitty's reunion with Excalibur is predicated entirely on a massive coincidence, such that one wonders why they hadn't bumped into one another at all during any of Excalibur's other recent adventures (Claremont also never gets around to explaining Brigadier Stuart's immunity to Mesmero's power or why Kitty was rendered powerless while at St. Searle's). 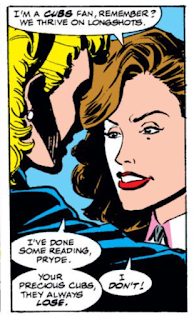 But Kitty is reunited with Excalibur, and its simply refreshing to have an Excalibur story with a clear beginning, middle and end that begins and ends in three issues, so it's easy enough to ignore these quibbles. As a swan song for Claremont, the co-creator of this series, this perhaps isn't all that compelling or declarative of a final issue, nor does it do much to tie up any of the lingering plot threads stil hanging around the series (other than the rather significant thread of reuniting Excalibur), but then, this story feels less like Claremont's final story and more like a one-off he did in the midst of a bunch of fill-ins. 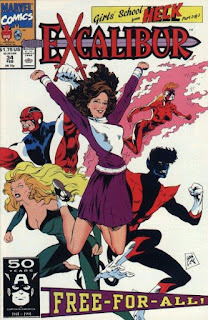 Nevertheless, it does heavily feature Kitty, a clear favorite of Claremont's, and it does end with the team he launched back together and whole. And sadly, given the state of this title since about midway through the "Cross-Time Caper", turning in a straight-forward, competent, complete story with consistent art is something of a minor achievement in and of itself. It's not the most glamorous or declarative of creative finales, but it does end Claremont's involvement with the title on a relative high note. Tomorrow, Wolverine fights Nazis in Spain in Wolverine #3. Next week, Rogue and Magneto grow close in Uncanny X-Men #274, and the New Mutants lose another teammate in New Mutants #99. Over at Supermegamonkey.net a commenter (on UNCANNY #268) points out that Claremont , in accord to his obvious general interest towards the royalty, will on later occassion (FF vol3 #9) make the Earth-9809 version of her "Caledonia", the last Scot remaining in the dimension, last of the line of royal Stuarts and "rightful heir not only t' throne of Highland Scotland... but t' mantle o' Captain Britain!" I've let myself be told she's older of the Stuart twins, so (if we are not particular to the male-preference bit in the crown succession, and it's Claremont so maybe we aren't) it's likely a case of the royal Stuart blood acting up here and her not being pushed around on her own turf. Which actually has some pretty awkward implications because the place where it happens is Salisbury Plains in England. Of course we all remember how the Catholic Monarchs of the House of Stuart were usurped from the throne in 1688 in favor of protestant heirs, prompting the Jacobite movement for the restauration of the perceived lawful monarchs, so this sort of thing looks bad for the current reigning Monarch. 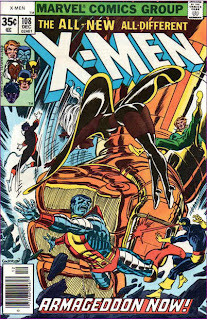 Later on Claremont will in his X-Men: True Friends, the book he has told he really really wanted to get made, go through some pains to show "Lilibet" as the lawful heir of the British throne, which I can only take as a irrefutable proof that sometime along the line Claremont has had a nocturnal visit from the men in black of the comic book department of MI-5, essentially telling him that "Her Majesty is not amused". Of course, another explanation is that he couldn't control her because she was already controlled by the Shadow King. Hmh. She was on Muir Island (and her brother wasn't) when the Reavers assaulted, but mysteriously disappeared alongside Amanda Sefton in middle of the happenings, before SK made his move. But later on Amanda will be seen as a thrall of SK on #278, and on the same issue where Alysande has returned to her day job at W.H.O. So, it's certainly plausible. But Mesmero's wording here when pondering the mystery (and announcing it to us the readers), "How can one Stuart be immune to my influence when her twin brother isn't? ", especially in light of the later info by Claremont about her rather hints towards her older Stuartness I feel. Though, Captain Britain is a some sort of champion of the realm and much help was that to him against the menace of Mesmero. I love Fenris as villains, seen here the last time (?) in their abominable red&green&black JRjr uniforms with Andrea as the more ruthless one of them as befits Claremont (which they will go and ruin the minute Claremont is out the door). A fitting after-chapter for their appearance in UNCANNY #200 along with 3/5 of Excalibur and yes, Jim Jaspers, who was trying to stone-pound Andrea. Terribly inconvenient power that, which always makes you to desperately scrape for a skin contact with the sibling in the finale of fight. I honestly can't think of many post-Claremont Fenris appearances. There's the Omega Red story in Adjectiveless, but they're mostly background players there (and I don't recall any one being any more ruthless than the other). After that...Andreas turning up in THUNDERBOLTS as Swordsman using a sword with his sister's skin wrapped around the handle so he can use his power. I'm sure they did some stuff between those two appearance, but I can't think of them offhand. Fenris also appears in one of Fabian Nicieza's CITIZEN V mini-series, which is where Andrea dies in the first place, thus planting the seed for Andreas's turn in THUNDERBOLTS. I'm hard pressed to think of anything else either. I think when their dad came back from the dead in the early nineties, their reason for being sort of disappeared. I’ll just say that based on the last 20 or so issues I’m glad to have dropped this series when I did. I hear that. Other than the mildly entertaining Nightcrawler vs. Krakoa oneshot/fill-in issue, this story was probably the best thing the series as done since at least the Davis-drawn "Cross-Time" issues, and given what a mishmash that story was, maybe even the best story since before that. And it's not even all that great of a story - it's just consistently written and drawn with a clear beginning, middle and end, and seems to be trying to do something with the characters, but that sadly puts it into the upper echelon of EXCALIBUR stories at this point.